The Sun Will Come Out Tomorrow - Why wait when you can have it today? The Sun Will Come Out Tomorrow – But why wait until tomorrow when you can have it today? Create your own Sunshine Who doesn’t love that cute red head, little orphan Annie and her infamous song, “The Sun Will Come Out Tomorrow”? I’m sure we can all sing it, “It’s only a DAY AWAY”. Which is great and hopeful but sometimes tomorrow seems so far away. 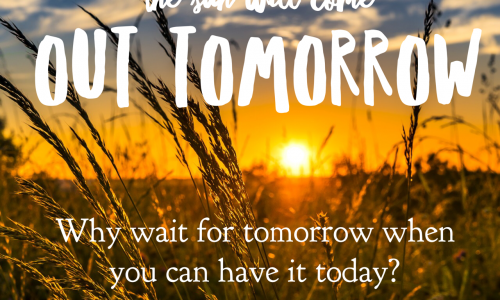 Why wait to feel the warming rays … Continue reading The Sun Will Come Out Tomorrow – But why wait until tomorrow when you can have it today?